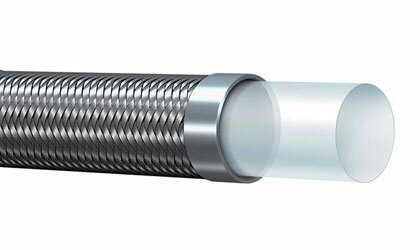 This new PTFE series hose has a smooth Teflon tube and offers high mechanical and vibration resistance, low permeability, dialectical, fire resistant, food grade (FDA, DVGW, and BFR compliant). Is chemically inert, non-sticking, ozone and weather resistant. The reinforcement is high tensile stainless steel braid AISI 304. Hose meets FDA US Pharmacopeia - Class VI SAE 100R14. Applications include compressed air, gas, steam, fuel, oil, chemical and pharmaceutical products. Click here for more info.